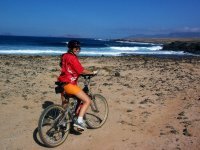 Lanzarote is excellently suited for cycling, both with racing cycles and mountain bikes. Mountains that are over 600 m high leave nothing more to be desired, and on the tours here you often have breathtaking panoramic views of the island and the ocean. … and last, but not least, an Ironman is held here annually with a 180 km cycling route.